The Bridge City Brew Trail spans the craft brew scene in hip Northwest Portland, home to some of Portland’s oldest and best known breweries. Let your tastebuds guide you through an assortment of pints, taster trays, a take-home filled growler, and discounts on beer and merchandise. Use a specialized app/webapp on your smartphone for area maps, information, and to redeem every item included. You'll enjoy an assortment of pints of beer, a sample tray, a filled growler to take home, and special discounts from Portland's finest breweries, all within walking distance. You have a year to redeem everything included so visit at your own pace. Linger and learn what makes each award-winning brewery special and discover your own Beervana. 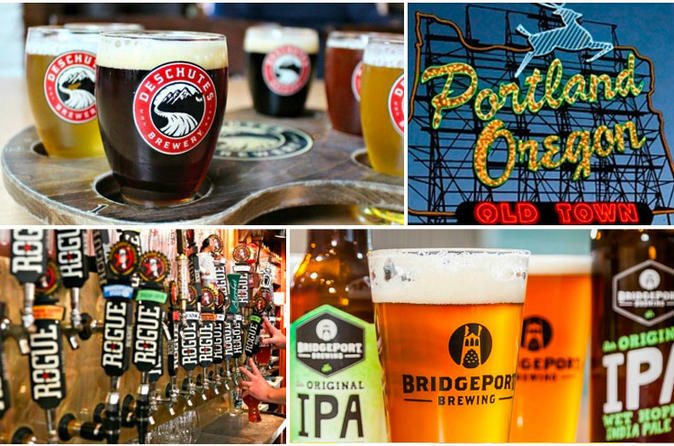 The Bridge City Brew Trail tour pack will have you sampling locally produced beer throughout the working breweries located the Pearl District, Portland's premier destination for shopping, dining, art and living. We've bundled the best area breweries into one package! You'll get to enjoy a pint of beer, taster tray, filled growler, or special offer at every stop! Since this tour is self-guided, you get to spend as much time as you’d like at each location. This is the perfect way to get familiar with Portland's craft beer culture and the Pearl District. All items in the pack are redeemed using your personal smartphone or mobile device and the tour company’s app or web app. Use the map feature to guide you along your way and choose your own order of destinations. Show the brewery associate what featured item you want and have them tap the "redeem" button to complete the transaction. It's really that simple! All items are valid for a year from purchase, so you can thoroughly take your time enjoying the benefits of your beer pack. This is the best deal for beer tasting in the area, and unlike any other local tour. You do not need to make a reservation at the breweries unless you are traveling with a large group. Must be 21 or older to drink. Please drink responsibly.